Time and again, we need something that can hold our coins together. For someone who is on the lookout for a nice coin pouch, they need not to look any further as Giftwrap offers the companion coin pouch. This is a 70d nylon coin pouch that is ideal for your day to day use. 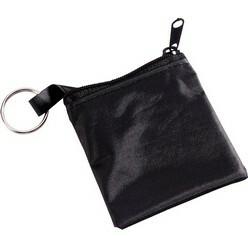 The coin pouch measures just 4 x 3.5 cm which means that it is very compact and can easily fit in any space that you want. Moreover, the coin pouch is available in black and you can even choose to get pad printing done on it to make it stand out. For anyone who needs a nice coin pouch key ring, this companion coin pouch at Giftwrap makes for an ideal choice simply because it is affordable and it is very ideal in size so you can place it in any space without fearing for the space to run out. Please browse through the items below. If you are interested click the "Request Quotation" link next to each item. A customer service consultant will contact you with a quote. Price estimate excludes branding, VAT and volume discounts apply.